Since I’ve moved to Nashville, I’ve been experimenting even more with what I’m eating. My wonderful roommate Kelly has introduced me to the amazing things you can make with JUST vegetables and raw food. We’ve been playing in the kitchen a lot, especially when it comes to sweets. Now, if you know me at all, you know I love pizza. It’s kind of my downfall. I would do almost anything for a slice of pizza. 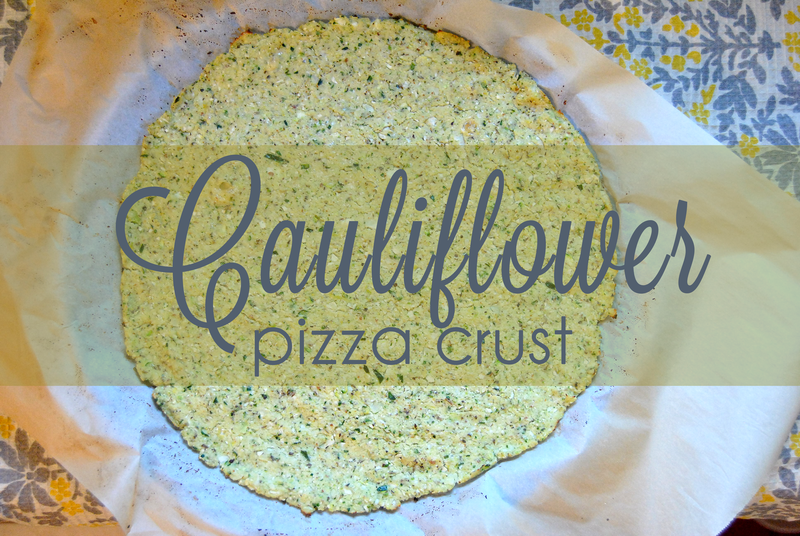 So here’s my healthy alternative: Cauliflower Pizza Crust! While this “pizza” may not be exactly the cheesy, bready goodness you know as pizza, hear me out! This dish will satisfy any Italian craving you may have and give you a HUGE serving of vegetables! Place a pizza pan or stone in the oven and preheat to 450F. Cut florets from cauliflower. You won’t need any stem, so try to get as much of the floret off as possible. Add cauliflower and zucchini slices to food processor and whirl around until it reaches a fluffy, snow-like consistency. Spray a saucepan with coconut oil and place cauliflower mixture in a pan. Cook over medium heat until warm, about 5 minutes. Stir frequently to make sure the cauliflower doesn’t burn. Transfer cauliflower mixture to a tea towel and let cool for 5 minutes. Once the cauliflower is cool enough to handle, use the tea towel to drain as much water from the cauliflower as possible. Squeeze it! You may have to use two tea towels just to make sure you’re getting the water out. Once your cauliflower is the majority of the way dry, transfer to a large mixing bowl. Add cheese, spices and egg. Knead the dough with your hands for a few minutes. You should yield about 2 1/2 – 3 cups cauliflower mix. If you feel as if you’re short, add almond flour and knead some more. 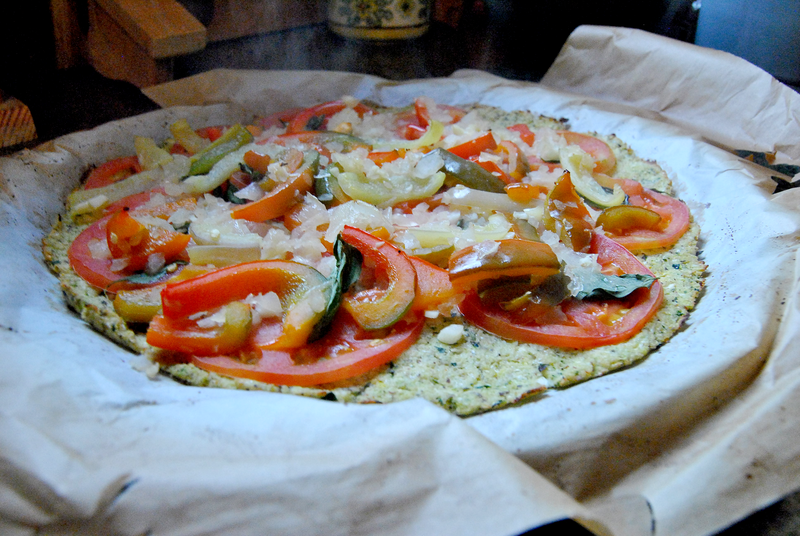 Spread the cauliflower crust into a circle on parchment paper. Don’t make the crust too thick, it won’t cook all the way through. Don’t make it too thin either, it will burn or crumble apart. Trying to make it about 1/2 an inch thick. Using a cutting board, transfer the parchment paper to the pre-heated pizza pan. Bake for 8-11 minutes, until crust is golden brown. Remove from oven and add your favorite toppings – I used tomato slices (instead of sauce), basil, bell peppers, onions, and garlic. Bake for 7 minutes. YUM! Never in a million years would I have thought that vegetables could replace my love for pizza. This “pizza” is like an Italian casserole, full of spices and flavor, but without the carbs and gluten. The cayenne pepper adds a nice spicy flavor, without the spicy feeling. The zucchini flavor is subtle, but adds a summery flavor you won’t forget. Finally, the small amount of raw cheese brings in the cheesy goodness you love in pizza, without the large amount of grease and food guilt. So go ahead, eat that second piece and feel good about it! To be honest, I’m dubious about cauliflower satisfying my pizza jones, but I think I will give this a try – and a shout-out – during Vegan Mofo next month! Thanks for the great post! What a great idea! 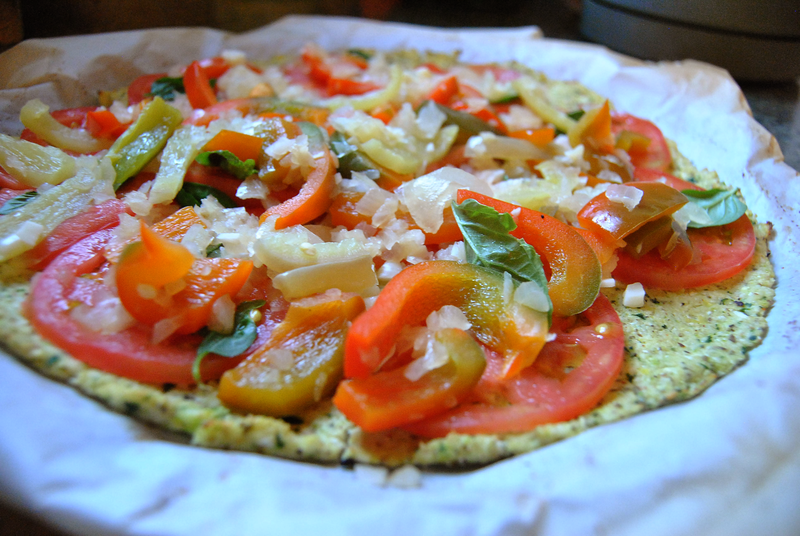 Is the cauliflower crust more moist than a traditional pizza crust? Is it comparable to a tortilla? Thanks! Thanks for visiting! It’s a bit more crumbly than pizza crust. Pizza is my downfall too. This looks like a great alternative! What an idea ! I make cauliflower paratha (bread) quite frequently. But this is novel ! I’ve seen this a few times. I think it’s a sign that I need to try it. Thanks for posting! It looks amazing! This looks great 🙂 Thanks for sharing my recipe as well lady! I love the taste of cauliflower pizza crust, but I always wind up either burning mine or making it too thick. How big was your pizza pan? My pan is standard size. However, my pan did have holes in the bottom of it for ventilation. The pizza cut into 8 pieces, so it’s about the size of a traditional medium pizza. The crust was about 1/2 inch thick. Did you try using parchment paper between the pan and your pizza? It really does work wonders. I haven’t! I’ll give that a try, though. Thank you! Very cool flavour twist. I have a caulie in my crisper that is just begging to become pizza! I want to give this a try, I’m wondering if you can lift the slices without the crust falling breaking? It does fall apart, unfortunately. 😦 That’s the reason there are only pictures of the whole pizza. 😛 It’s delicious either way! I don’t think you can get a healthier pizza than this one! Tried it, tastes amazing (though mine was somewhat thicker than the one on the pictures), thanks for sharing this great idea! Yum! I can’t wait to try it and I’m so glad I’ve just ‘discovered’ your blog. I’m going to add it to my feedly. Thanks for sharing all this great food! As a gluten free gal, I am excited to try this!